Ancient Battle were fought in organised formations. The leaders of both sides directed their forces along the battle line to gain tactical advantage in order to overwhelm their opponent in the centre, breakthrough one of his flanks, or hold their position until the time came for a decisive move. How will you muster your battle line? Your objective is to create powerful formations on your side of the nine Flags, in order to beat the formations on your opponent's side of the respective Flags. 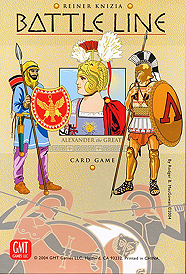 The first player to win three adjacent Flags (a Breakthrough) or any five Flags (and Envelopment) achieves victory Battle Line is based on Riener Kjizia's original design published in Germany as Schotten Totten. Battle Line enhances and expands the game system to give players more tactical options.